The timer is counting down the minutes until I can finally take them out of the oven. Twenty-five minutes. Twenty-five minutes can seem like an awfully long time when you’re waiting for something very, very good. So I start the efficient flipping-open, flipping-shut of cupboard doors…returning soda and oats and wheat bran–each to its own nest. Then begins the clickity-clack business of gathering of bowls, teaspoons, measuring cups and cutting board… slipping them into the sink for a quick rinse. Twenty-two minutes. Through the oven window, I see twelve little, pale, lumpy blobs of batter wilting. Each sagging against the sides of its assigned circle, succumbing to the heat of a 350 degree oven. They don’t look all that appealing right now. Even with the little bits of dried fruit–apricots, pears and berries of all kinds—winking at me from the nice, hot oven. And even, with the honey-colored crystals of the sugar-topping reflecting the light, I am not the least bit tempted to pull them out and say “good enough” at this point. But at the halfway mark on the timer, something whispers to me as I stand at the dryer door folding clothes—just the faintest hint of the sweet fragrance rising from the baking muffins. I fold the last shirt. Still, I must wait. I grasp the bright yellow handle of the broom and begin swishing the time along with the bristle-tips, teasing crumbs and flour from kitchen corners. Ha! I sweep two minutes up into the dustpan and let it slide down over egg shells and balled up paper towels in the trash. I put the broom and dustpan away. Still eight minutes remain: plenty of time to run the vacuum. I vacuum quickly, as if this will somehow hurry the time along. As I start to wrap the thick black cord around and around, I am drawn helplessly back into kitchen by streamers of brown sugar and toasty pecan aromas mixing in the air. I steal a glance at the timer. Oh, still 4 minutes. I return to finish the job in the dining-room and realize that I can escape it no longer. The lovely aroma has lilted into the dining room. I tuck the vacuum in for the night and pull the storage room door shut tight. I turn and drink in the rich, honey fragrance. As I breathe it in, I can nearly taste those wonderful muffins…even though I cannot see them. Before I have a chance to inhale another lovely, muffin-scented breath, I hear the sound I have been waiting the longest time to hear. Nearly tripping over my own feet, I rush to the kitchen to find those little muffins peeking out from their place on the lower rack—all huddled together, counting, “1..2..3”, as if they could all swing their weight to one side and tumble out onto the kitchen floor to scamper away. But I am too quick. In a flash, I swipe an oven mitt from its hook and slip it on. As I open the oven door the rich, sweet aroma rolls over and around me filling the kitchen with a fragrance so full and so delicious and so good. Caught up in the tide of fragrance flooding my home, I imagine it lifting me up and carrying me along the counter tops and on through the dining room door. Carried along, an apron-clad astronaut of sorts, I tip forward a bit and tumble through the air in a loop, head over head over heels…wheee…landing softly in my old worn-out wing back chair, muffin in hand. But, instead, I spy the oven mitt on my hand and come back to my senses. I am still standing in the kitchen, hovering over an open oven door. With even greater anticipation, I poke one of my fragrant little friends; my heart is elated as the golden treat cheerily springs back. Done! I don mitt number two and whisk the crumb-topped crew out of the hot oven just in the nick of time. Lifting the oven pan high in both hands, I nearly twirl in a waltz-like maneuver, from the oven door to the counter top…to the empty cooling rack. Closing the oven door, I realize…there’s still more waiting to do. Sigh. Maybe I can find something else to do while I let them cool. Oh! I could write…and so here I am, all the way across the house…and, still, I cannot escape the delicious fragrance of those muffins! It’s nearly impossible to keep my mind on writing…and, most assuredly, would not have made it thus far if I were attempting to write about anything…but muffins. The delightful fragrance which fills my home will not let me forget what awaits me. Drawn by the sweet aroma, I am lifted from my place at the desk and find myself stepping lightly toward the cooling rack. Ah, yes…I finally have that which has beckoned me, for what seemed like a very long time. 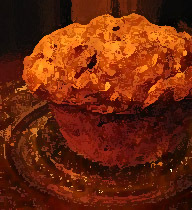 As I sink into my favorite chair and enjoy this wonderful, fresh-baked muffin; I am pleased…and finally satisfied…as it is every bit as good as I thought that it would be. I Thessalonians 4:16-18 …Therefore encourage each other with these words. wow…best description of muffin baking experience ever! I felt like I was waiting with you in your home…great, now I’m hungry and trust me…I’m no muffin baker. Thank you for sharing and reminding me that my hunger and thirst for God should never be anyless than that of muffins. So easy to enjoy the things of this world, but God wants us to enjoy a relationship with Him through His son Jesus Christ. I do not always see waiting as a journey to enjoy, but your muffin waiting experience reminds me that anticipating God is gift to be lived through and makes the end result so much sweeter. Ironically, as I read this, I was waiting on my own Morning Glory Muffins to bake. You put into words all I was thinking and feeling and more. Wonderful way with words. Hope you enjoyed the muffins! For other readers, I don’t want you to feel excluded…so if you want to see what’s so incredible about Morning Glory Muffins go to Cooking Light site and search for “morning glory muffins”. I use all kinds of chopped up dried fruit in lieu of the dates and go with chopped pecans and mix the flax seed in with dry ingredients. Then I use wheat germ mixed with raw sugar on top. Oh my!